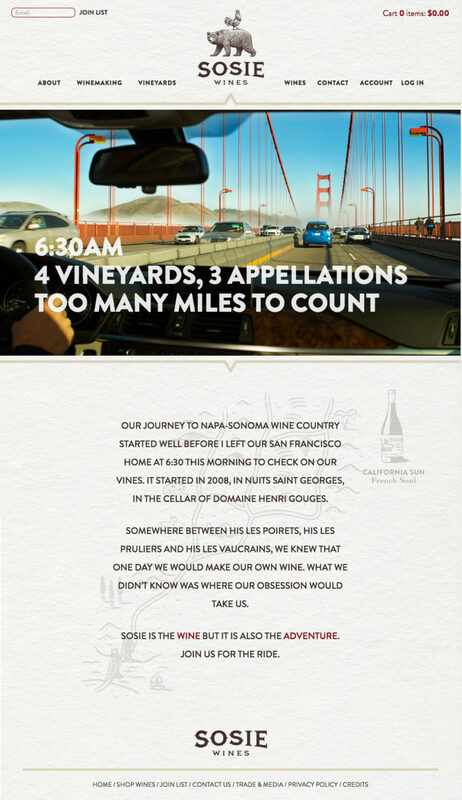 How do you launch a virtual winery from scratch? What do you say about a business when there is no winery, no history, no story? You make it up is what you do. Creating a brand out of whole cloth is about improvisation. About taking whatever threads you can pull together and weaving them into a credible, compelling narrative. That’s what we did for Sosie. We cast their story as the adventure that it is. From the owners’ early, formative experiences to their European wine travels to their forrays into the vineyards of Napa and Sonoma. At every turn we found (and sometime embroidered) a telling anecdote. Before long we had a website with substance. As the business develops and the wines find an audience, the site will surely be refreshed.Because there will be new stories to tell and better wines to sell.